THE General Body stands in solidarity with the thousands of outraged individuals who have taken to the streets in the last 24 hours to peacefully protest the lack of a grand jury indictment for Darren Wilson, the St. Louis police officer who murdered teenager Michael Brown. 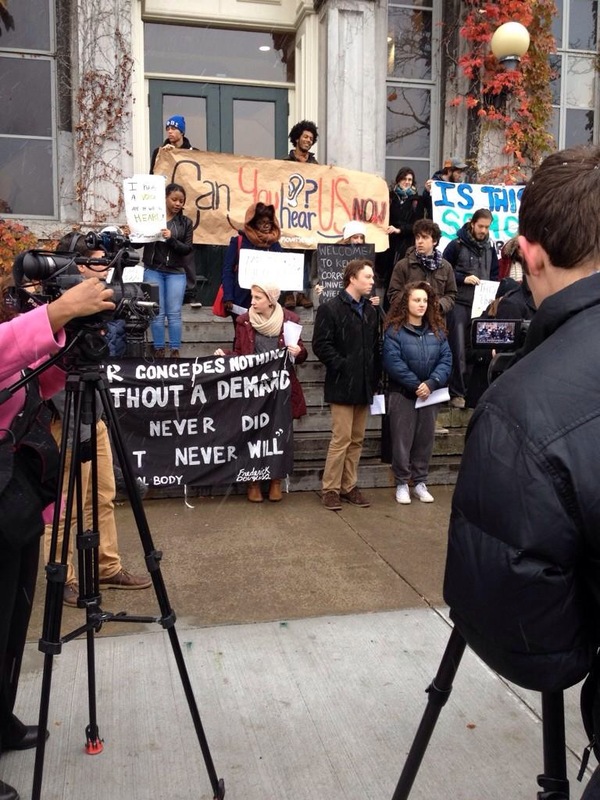 We anticipate two criticisms to this stance: first, that we should stay focused on the struggle at Syracuse University, a position articulated to us this morning; second, perhaps that it is an insult to Michael Brown and the other murdered victims of police violence to compare a campus struggle with the struggle for life itself in the face of police brutality and state violence. To both these claims we can only say that the fights for justice on city streets and on campus walkways is not only symbolically but actually the same fight. Our fight at SU and the nationwide fight of last night’s protesters are fights against racist profiling, institutional and structural racism, surveillance, and overpolicing; the insidious narratives of biased media; the refusal to see systemic crimes of poverty, gun violence, sexual violence, and mental illness as public health issues deserving of serious medical response; and the deferral by power brokers to broken legal channels. Active protest for social justice displays the will of community members to risk their personal well-being for collective health, safety, and change. Universities are microcosms of the world, and student activist movements respond to the same systemic inequalities, manifested on campuses, that appear the world over. As a coalition of students, faculty, staff, and community members committed to social justice and policy change, it is consistent within our mission as THE General Body to raise our voices and join in physical protests for the life of Michael Brown. Ultimately, our fight is the fight of protesters across the country because, here at Syracuse, we also are raising our voices to proclaim that Black Lives Matter. 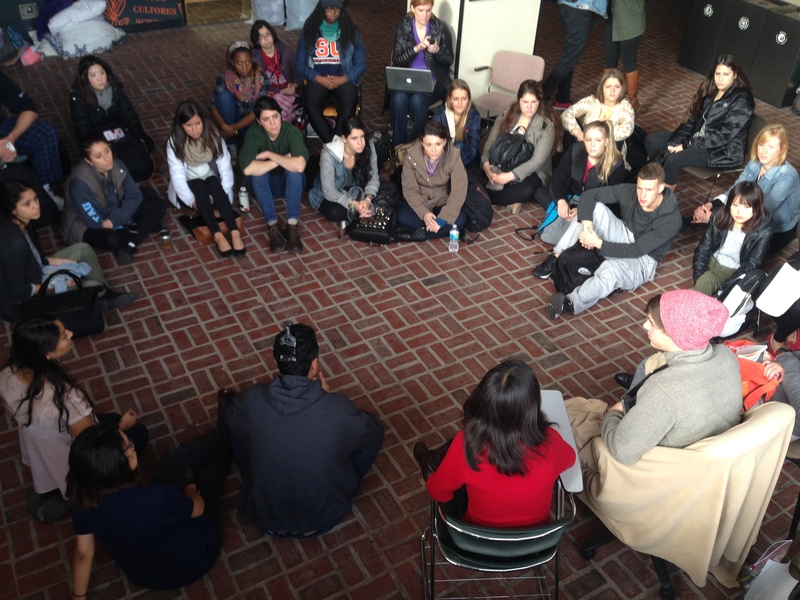 Students of color arrive at Syracuse having already experienced police discrimination and violence in their home communities, violence that is replicated in the city of Syracuse and implicated on our campus. We see that police violence is sexual violence; that police and war violence create disability; and that obfuscated financial transactions underlie the systemic inequalities that make such unequal power relations possible. 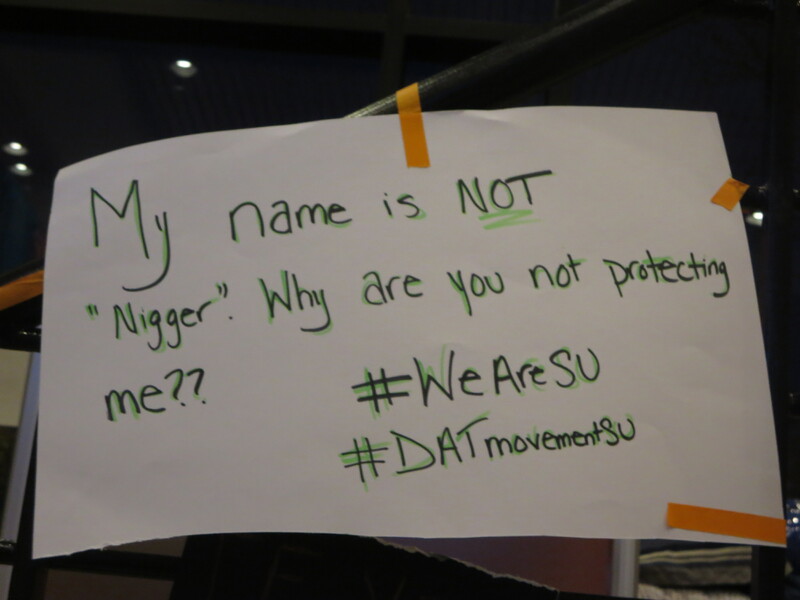 Members of THE General Body will be present at multiple events in the Syracuse area and on the Syracuse campus to protest and process these recent events. This afternoon, SU’s Hendricks Chapel will host an interfaith prayer service from 12:30 – 12:45 PM. The Chapel will remain open for silent prayer and reflection from 12:30 – 4:00 PM, at which time the Diversity and Inclusion Workgroup will sponsor a structured conversation on the events in Ferguson, moderated by Kim Williams. The dialogue will end at 5:00 PM. And the Syracuse community will hold a peaceful protest at noon Tuesday (today) outside the Syracuse Federal Building, 100 S. Clinton St. The National Action Network will hold a town hall meeting at 10 AM Saturday at Fountain of Life Church, 700 South Ave., to discuss the Ferguson announcement and police policy issues on topics including tasers and chokeholds. See the Post-Standard for more on community events. Please join us at these events, and visit our Facebook page and group to coordinate with other members who will be in attendance. My name is Vani Kannan, and I’m going to talk about where THE General Body is going next. Last night we gathered to discuss our future. The conversation went late into the night, and reinforced for me the strength, passion, clarity, and commitment to each other and to this campus that I have observed throughout this movement. Being in this room has been one of the greatest educations of my life. The deep commitment of the people in this room to each other, to the university and to the Syracuse community, should not be underestimated. The faculty, staff, and community support we’ve received this week speaks more loudly than any one person can. The messages of solidarity from universities across the country, where students are struggling with the same corporate imperatives speak more loudly than any one person can. The letters from students, alumni, faculty, staff, and community members about their individual, collective, and institutional struggles speak more loudly than any one person can. And the messages of solidarity pressed against those glass windows, which speak to the crackdown on dissent nationally and globally–scream much louder than any one person can. This is our 18th day in Crouse-Hinds. After this press conference, we will be leaving. We are leaving with the knowledge that what we are asking the Chancellor to commit to works towards equity, justice, and safety for every person here today and every person not here. We are moving into phase two of the General Body, starting now. This new phase represents a growing body of students, faculty, staff, and community members who refuse to submit to undemocratic administrative policies that hurt this campus and this community. We will continue to fight alongside each other despite the forces that are trying to divide us. When we look back, and look around, we know we are in good company. Now, today, we are leaving this building, but we are not going anywhere. Witnesses to the truth of what Chancellor Syverud’s move toward efficiency means in terms of real lives affected. I have refrained thus far from joining my colleagues in vocal support of “THE General Body,” because I was and am personally uncomfortable with signing on to an extensive and fluid set of demands. This evening, however, I’ve been told that the students at Crouse-Hinds have been denied access to their lawyers, while being served with documents that can only be interpreted as threatening, given the circumstances. I am not a lawyer, and cannot claim to know whether a judge would rule this an abrogation of the constitutional right to counsel. But there is absolutely NO DOUBT in my mind that it is counter to the values that most of us at SU try to live by, and the values that I had hoped that you would lead us in respecting. To threaten (directly or by implication) a group of non-violent student protesters with legal action, whilst simultaneously denying them the chance to meet with their lawyers is simply unconscionable. While I may not agree with every one of the student protesters’ demands, I do respect the commitment that underlies their actions. I believe that their willingness to commit themselves to their ongoing action actually reflects credit on this institution — I teach in a School of Citizenship, and these are students who are taking their citizenship very seriously indeed (they could perhaps be contrasted with the students who regularly bring disrepute on us all with drunken antics that do not seem to result in their receiving threatening letters). 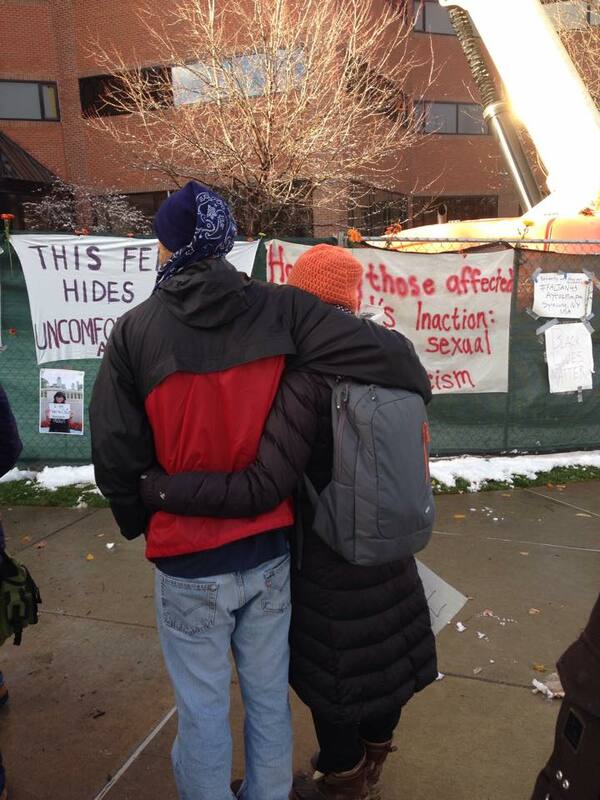 It’s my belief that the values of Syracuse University would be best expressed by allowing non-violent protesters to remain in place while respectfully engaging with their concerns, by refraining from threats, and by respecting their legal and ethical right to meet freely with their legal advisors. In one of my classes in 1986, I think it was, I was trying to get my students to see beyond the easy binary of black and white racism, not by acknowledging “shades of gray” as that only honors and maintains the original problematic binary, but by getting them to see a world comprised of people, people whose histories, whose day-to-day existences were nuanced and often, for many if not for all, needlessly encumbered by easy categories that hold them back as individuals. While this is true for all students, the particular consequences of these encumbrances could be very different in scale depending upon the color of one’s skin, the demarcations of gender, etc.. In essence, I required that my students engage in what I considered to be the most important question of our day—the question of how and why we can understand and should respect the ideas and lives of other individuals who may be marginalized and even victimized by collective habits and understandings? Why did you come to Syracuse University? Because it’s a party school. I know this must resonate. A party school. When you first arrived, you walked among our students to “get a feel” for campus. I believed then that you really wanted to know what it was like to occupy that space, that intellectual space. But I wonder, did you ever try to reach out to a young woman who was a victim of sexual assault? Did you ever try to navigate the hills and social parameters of campus from the seat of a wheelchair? Did you think about the reasons buildings like Whitman and Newhouse (both 1 and II) secure the geographic and metaphoric spaces on the hill in relation to buildings that house African American Studies? Or Native American Studies? It’s not that you would change the geographies of our campus, but that you would understand them at the level necessary to make appropriate and democratic choices for all. This summer I taught a course in academic writing and I asked students, as they were going to be working together in groups to name themselves. I was amused to find one group named themselves Deers and Bears. I thought of you, and the email I responded to with quite a bit of tongue wedged in my cheek. My response to you was “I’m from New York City so I don’t say Searacuse or Seeracuse. I pronounce it Sieracuse—as in sieve.” I’m sure there are many more pronunciations depending on the speaker and the purpose for the articulation or the geographic region from which the speaker emerges. But the meaning of the term is more important. And, of course, there is no one thing Syracuse University will mean to all because language itself is a messy business. We will never really erase the “party” brand, nor would we necessarily want to. Syracuse University is, after all (we hope after) a place that promises fun in many forms. But what about that entry of yours into this community will you make serious? We honor the best in them: their willingness to engage in democratic learning, their willingness to stand up (when they can) for their, for our beliefs, their willingness to show compassion for others who walk or sit among us, and to stand or sit for what they know to be just action. So I wondered on Wednesday, when I left campus to travel downstate why you had not yet spoken, in your own truest voice, your own most critically alert, gravity packed with the certainty of your own office voice, to what is at the core of the grievances of THE General Body. Why would you not sit with them, roll up your sleeves and ask the more meaningful questions? And then you did. In a brief and dismissive email, you answered. You ended we will do better. And better we now see is to deploy DPS, the university’s legal team and public relations documents that simplify and erase the importance of this movement. I am really trying to understand. And I know, because I read in their deep, critical descriptions of what it is like to be heard on this campus, that the students who are THE General Body want to know this as well. Over the past 24 hours there have been significant and unfortunate misunderstandings regarding the current situation in Crouse-Hinds Hall. 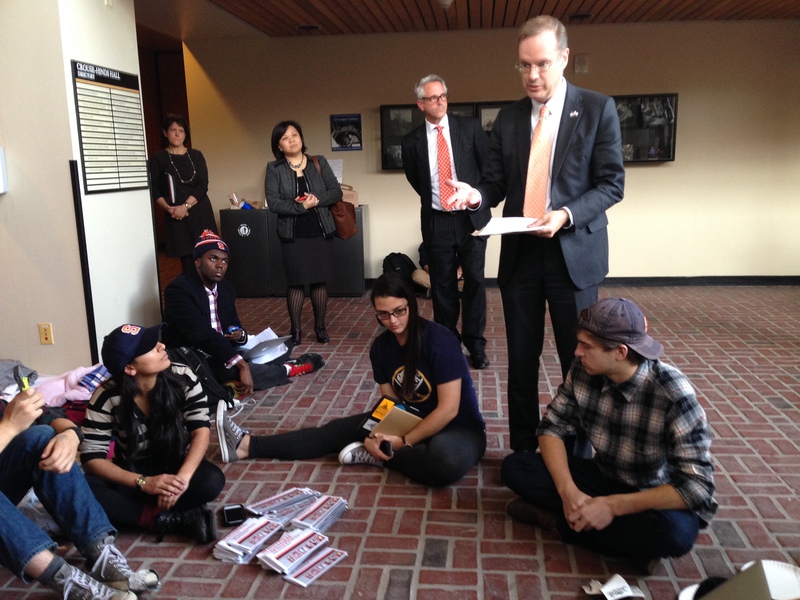 Tomorrow, Monday, Nov. 17, will mark the 14th day of essentially unfettered access to Crouse-Hinds Hall for the students protesting their concerns. [not unfettered. DPS officers come in every night to cordon off the students to the lobby on the first floor, with no access to other rooms or floors. By contrast, most university buildings lock at night but students have access with ID cards and could easily permit another student to enter, could leave and re-enter, and cound enter classrooms in the buildings.] The only restrictions that apply are [arbitrary and never delivered in writing] fire code rules, expectations that have been set to allow mission-critical University functions such as teaching and learning to continue, and access restrictions to the building when it is closed. During the hours the building is closed, students have been advised that they may remain, but if they depart they cannot return until the building opens. No other individuals, unless they have prior approved access to the building, are able to enter the building during the time it is closed. The same policy applies for many other buildings on campus. 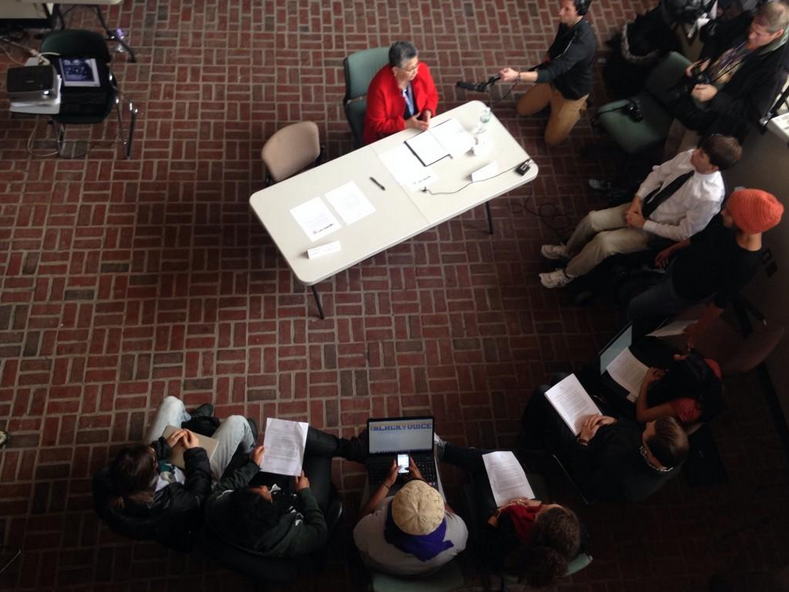 During the hours the building is open, students, faculty, staff and community members have been allowed to gather, hold teach-ins, invite outside speakers, and conduct other activities not normally held in this space; they also have been allowed to come and go freely. I hope you will recognize that during the past two weeks this process and dialogue has resulted in change, progress, [yes change and progress arising due to THE General Body and their efforts which the Chancellor and administration attempt to co-opt to hide their inaction and decorate their intent. But certainly we have different definitions of dialogue. We do not call a “final” response a dialogue] and a significant commitment [prove it! Sign a commitment to address student needs] by the University administration to meet many of the demands brought forth by students. This said, it is clear that the current equilibrium is not sustainable and that all of us should be focused on finding and supporting a more permanent process for engagement [again trying to deflect into preexisting and ineffective channels whose inefficacy are part of the cause of protest in the first place]. I am writing to add my deep distress about recent decisions you have made about how to deal with the student protesters on our campus. I have been a tenured full professor at this University for over 23 years, and I have never been prouder of our students. There are so many laments about apathetic students and those who are more concerned about partying than they are about their own educations or broader issues of social justice. And now, we have all witnessed some of the finest thinking and organizing ever on this topic. This has truly been democracy in action. The students have been well organized, supportive of one another, thoughtful about their own educations and decisions and policies on campus that are problematic — and they have communicated all of this respectfully. Those of us who have supported them from the beginning have been watchful of how the administration would respond, and, at first, I was quite hopeful. There seemed to be a real respect for the thinking and integrity of the students, and the entire situation has provided so many teachable moments about social change and advocacy. Two students from the General Body came to speak to my class on Social Justice and Diversity last Friday, and they were magnificent. They were neither strident nor angry, but were articulate and clear about their concerns, the courses of action that would alleviate those concerns, and the ways in which their demands transcended individual wants or needs. I was so proud of them, and thrilled that my students (who are preparing to be educators) could have such a clear model of how one moves from beliefs and ideologies to action. This is, indeed, a critical moment in your relatively new position of leadership, and all eyes are on you and on Syracuse University. I urge you to think about what kind of University we are and what kind we will become if the response to the students is heavy-handed and menacing. I want to continue to be proud of my institution and of the administration as models of civic engagement and a commitment to social justice and diversity. Many of the student concerns focused on issues of transparency, and the most recent decision to deny students access to legal counsel, seems to confirm the impression that things happen in secret and in private and that those of us who should know and want to know are left out of the loop. As co-chair of the working group on Participatory Experiences on Diversity, I can only say that THIS challenge to you and the administration provides the most powerful example of how one provides meaningful and important opportunities to broaden student and faculty understanding about diversity and inclusion. Adding a course on diversity will never be as significant as what the entire community will learn from how this challenge is handled. I am willing and able to speak to you or Bea personally if I can be of assistance in thinking and re-thinking how one deals respectfully with the General Body on our campus. I am writing in response to the startling news that you denied students of THE G.B. access to legal counsel this weekend. Such an egregious action stands in stark contradiction to words you have expressed in letters and emails to the university at large, and frankly it is difficult to interpret it as anything but a misuse of your power to instill fear and compliance in our students. Ironically, it is precisely this kind of sharp diremption between your actions and your words that initiated student protests over the summer and fall. I cannot imagine that this latest action will do anything but galvanize their protest, solidify their resolve, and garner increasing support from faculty. Against my better judgment, I want to tell you that your inaugural speech in Hendricks Chapel last year brought tears to my eyes. It felt physically relieving to hear the leader of our university foreground and value pedagogy in both its world-preserving and world-transforming possibilities. I had hoped to find in you a chancellor who would carry those priorities into his leadership. The protests of THE General Body present a most acute opportunity to enact the messages you gave us that day. Here is your opportunity to show us and show all those news outlets and non-S.U. eyes what a university is and what a university can be. Here is the place to show us how teaching can both carry forward and transfigure what earlier generations have taught us. How you respond now to our students simply is your vision of a university, in its institutional, pedagogical, and aspirational components. Please reconsider your approach and set out to meet the high bar you set yourself in your inaugural speech: engage our students as a teacher who cares for their intellectual, emotional, and practical development.